Samoilenko О.А., Milinevska O.A., Karnaushenko O.V., Shlyakhovenko V.A., Zaletok S.P. Summary. Aim:To study the influence of polyamine metabolism inhibitors on the growth, metastasis and ornithine decarboxylase (ODC) activity of Lewis lung carcinoma. Materials and Methods: Experiments were performed on female mice C57Bl/6 with Lewis lung carcinoma. Nω-hydroxy-nor-arginine (nor-NOHA) and α-difluoromethylornithine (DFMO) were used as arginase and ODC inhibitors, correspondently. Inhibition of tumor growth was calculated by comparison of tumor volume in the treated and control groups. The average number of metastases per animal in the group and the average volume of pulmonary metastases per animal in the group have been determined. 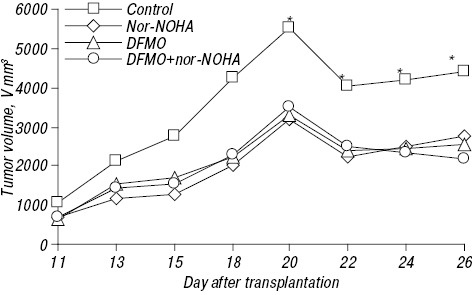 Determination of ODC — the key enzyme of the polyamine synthesis — in the samples of experimental tumors was performed by method of Luqman S. Results: Administration of DFMO or it’s combination with nor-NOHA resulted in the decrease of tumor growth rate, number and volume of lung metastases and was accompanied with reduced ODC activity in tumor tissue. Сonclusion: Modifiers of polyamine metabolism may be considered as promising targeted cancer therapy. Abbreviations used: DFMO — alpha-difluoromethylornithine; nor-NOHA — Nω-hydroxy-nor-arginine; ODC — ornithine decarboxy­lase; PA — polyamines. Polyamines (PA) — putrescine, spermidine and spermine — natural polycations, which play a crucial role in many fundamental biological processes: DNA replication, transcription, translation, membrane protein function, protein folding and others [1–6]. The level of PA largely vary during physiological and pathological processes (embryogenesis, ageing [7–9], regeneration, infections, malignant transformation [10, 11]). The increased level of PA in tumor growth is used as a marker for monitoring in course of a disease and efficiency of therapy [12–14]. Inhibition the level of PA by blocking the activity of the key enzyme for putrescine synthesis ornithine decarboxylase (ODC) — one of the most promising directions in the development of new approaches to the cancer treatment. PA metabolism is regulated at different levels by a complex system of enzymes, which are prima­rily enzymes of PA synthesis and transformation. The modification of genes regulating PA metabolism by external factors, not studied enough. The aim of this work was to study the effect of inhibitors of PA metabolism on the growth and metastasis of experimental Lewis lung carcinoma in mice. Experiments were performed on female C57Bl/6 mice 16.2–23 g. Tumor strain Lewis lung carcinoma was obtained from National Bank of Cell Lines and Transplanted Tumors of R.E. Kavetsky Institute of Experimental Pathology, Oncology and Radiobio­logy, NAS of Ukraine (Kyiv, Ukraine). All experiments were conducted in accordance to international rules of work with laboratory animals . Lewis lung carcinoma transplanted intramuscularly into the shin of the right rear leg 3•105 tumor cells in a volume of 0.2 ml of sterile isotonic sodium chloride solution. Animals were kept on a normal diet with free access to water. Each treatment group had 3–6 animals, control group — 4 mice. Inhibitors applied: arginase inhibitor — Nω-hydroxy-nor-arginine (nor-NOHA) (Cayman Chemical, USA), inhibitor of ODC — α-difluoromethylornithine — DFMO (Centre de Recherche Merrell International, 16 rue d’Ankara, 67084 Strasbourg Cedex, France). 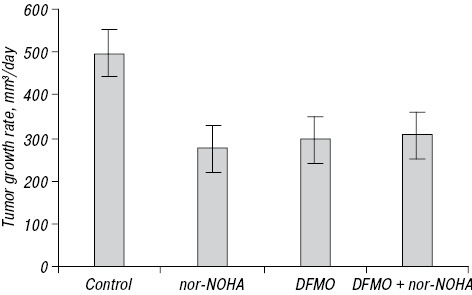 nor-NOHA prepared immediately before use and injected into the abdominal cavity of mice in a dose of 60 mg/kg (1.2 mg per mouse in 0.2 ml of isotonic sodium chloride solution) starting 7 days after tumor transplantation. A comparative analysis was performed versus a group of non-treated tumor-bearing mice (control). In each treatment group, 5 injections of an inhibitor were made. Control animals injected with 0.2 ml of ste­rile isotonic sodium chloride solution. The volume of tumors registered throughout the experiment. The animals were decapitated 1 day after the last injection of the inhibitors that is 14th day, and on the 26th day after tumor transplantation. where a — short, b — longer diameter of tumor. where Ac — the number of metastases to the lung in mice of the control group and Ae — the frequency of metastases in a treated group. Determination of the ODC activity in the samples of expe­rimental tumors was performed by method S. Luqman [16, 17]. The method is based on the fact that the correspon­ding enzyme converts L-ornithine hydrochloride (substrate) to the yellow colored putrescine adduct soluble in pentanol, which measured by spectrophotometer. The statistic processing of obtained results was conducted with the help of Student’s t-criterion. The data were reported as the M ± m.
Arginine is a precursor for ornithine which may be then converted into putrescine — the first participant in metabolic transformations of PA . It was found that DFMO — specific inhibitor of ODC — prevents progression of cancer cells in model systems . L-arginine is a nonessential amino acid that plays a central role in several biological systems including the immune response. L-arginine is metabolized by arginase I and arginase II with farther creation of ornithine . In our experiments, the effect of PA synthesis inhibitors — DFMO and a competitive inhibitor of ornithine synthesis nor-NOHA — on the Lewis lung carcinoma growth has been performed. The results are presented in Fig. 1, Table 1. As can be seen, there is a significant inhibition of tumor growth begining of the eleventh day of the experiment. During the experiment, both inhibitors studied demonstrate inhibi­ting activity (within 28–43%). In this regard, it was important to follow the changes in the dynamics of tumor growth that presented in Fig. 1. Note: *p < 0.05 as compared to control. Assessing the growth rate of the primary tumor node, it was found that average daily increase of tumor volume in the control group of animals within 9 days (11–20 days) was 497.2 ± 56.0 mm3. The use of both studied inhibitors and their combination led to a significant reduction in the rate of growth, the latter was about 300 mm3 during the same time period. Significant difference in the impact on growth inhibition when using different inhibitors was not found (Fig. 2). It is known that transplanted Lewis lung carcinoma refers to metastatic tumors, so anti-metastatic effect, as to this tumor strain, is an important indicator of antitumor effect. The results of the next section of experiments devoted to examining the influence of inhibitors of PA metabolism on the growth of lung metastases (Table 2). Note: *p < 0.01 as compared to control. As it is seen, the number of metastases in the lungs of all treated mice did not differ versus control. At the same time, volume of the metastatic lesions in the DFMO and DFMO + nor-NOHA groups was near 90% less versus control. Taking in mind the importance of the ODC enzyme and PA synthesis for cell proliferation, the next section of research was devoted to study of ODC activity in the cells of Lewis lung cancer after the action of inhibitors of PA metabolism. The experimental results are presented in Table 3. Note: #0.1 < p <0.25; *0.025 < p < 0.01; **0.01 < p < 0.005 as compared to control. The data obtained show that ODC activity in the tumor increases during the tumor development. On 26th day of experiment, ODC activity in tumors in all treated groups was decreased versus control (see Table 3). It may be expected that inhibition of ODC activity is the main cause of inhibition of tumor growth. Our preclinical data indicate that DFMO in combination with inhibitors of arginase has potential for chemoprevention of cancer and should be evaluated in other models and in combination with other drugs in anticipation of future clinical trials. 1. Igarashi K, Kashiwagi K. Protein-conjugated acrolein as a biochemical marker of brain infarction. Mol Nutr Food Res 2011; 55: 1332–41. 2. Lopatin AN, Makhina EN, Nichols CG. Potassium channel block by cytoplasmic polyamines as the mechanism of intrinsic rectification. Nature 1994; 372: 366–9. 3. Williams K. Modulation and block of ion channels: a new biology of polyamines. Cell Signal 1997; 9: 1–13. 4. Ha HC, Sirisoma NS, Kuppusamy P, et al. The natural polyamine spermine functions directly as a free radical sca­venger. Proc Natl Acad Sci USA 1998; 95: 11140–5. 5. Kurata HT, Marton LJ, Nichols CG. The polyamine binding site in inward rectifier K+ channels. J Gen Physiol 2006; 127: 467–80. 6. Agostinelli E, Marques MP, Calheiros R, et al. Polyamines: fundamental characters in chemistry and biology. Amino Acids 2010; 38: 393–403. 7. Liu P, Gupta N, Jing Y, et al. Age-related changes in polyamines in memory-associated brain structures in rats. Mol Neurosc 2008; 55: 789–96. 8. Gupta VK, Scheunemann L, Eisenberg T, et al. Restoring polyamines protects from age-induced memory impairment in an autophagy-dependent manner. Nat Neurosci 2013; 16: 1453–60. 9. Minois N, Carmona-Gutierrez D, Madeo F. Polyamines in aging and disease. Aging 2011; 3: 716–32. 10. Casero RA Jr, Marton LJ. Targeting polyamine metabolism and function in cancer and other hyperproliferative diseases. Nat Rev Drug Discov 2007; 6: 373–90. 11. Pegg AE, Casero RA Jr. Current status of the polyamine research field. Meth Mol Biol 2011; 720: 3–35. 12. Park MH, Igarashi K. Polyamines and their metabolites as diagnostic markers of human diseases. Biomol Ther 2013; 21: 1–9. 13. Kawakita M, Hiramatsu K. Diacetylated derivatives of spermine and spermidine as novel promising tumor markers. J Biochem 2006; 139: 315–22. 14. Hiramatsu K, Takahashi K, Yamaguchi T, et al. N(1),N(12)-Diacetylspermine as a sensitive and specific novel marker for early- and late-stage colorectal and breast cancers. Clin Cancer Res 2005; 11: 2986–90. 15. Council Directive 2010/63/EU of 22 September 2010 on the protection of animals used for scientific purposes. Official J Eur Commun 2010; L 276: 33–79. 16. Luqman S, Masood N, Srivastava S, et al. Modified spectrophotometric and methodical approach to find novel inhibitors of ornithine decarboxylase enzyme: a path through the maze. Protocol Exchange 2013; doi:10.1038/protex.2013.045. 17. Shlyakhovenko VA, Milinevska OA. Determination of ornithine decarboxylase activity. Lab Diagnostics 2014; 1: 36–38 (in Ukrainian). 18. Morris SM Jr. Recent advances in arginine metabolism: roles and regulation of the arginases. Br J Pharmacol 2009; 157: 922–30. 19. Mohammed A, Janakiram NB, Madka V, et al. Eflor­nithine (DFMO) prevents progression of pancreatic cancer by modulating ornithine decarboxylase signaling. Cancer Prev Res 2014; 7: 1198–209. 20. Albina JE, Caldwell MD, Henry WL, et al. Regulation of macrophage functions by L-arginine. J Exp Med 1989; 169: 1021–9.